Hello and thanks for taking a look at my deck! 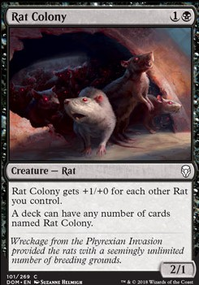 I like trying to find decks within standard that are fun and can take the meta by surprise... and whats more surprising than many many rats. Barrier of Bones , Duress , and Pilfering Imp give us a turn one play. Bones blocks and lets us dig a little. Duress allows us to slow down the opponent. The Imp interested me, allowing for a flying blocker to help us hold till we have many rats, and if it lives til later then it can get rid of a card from the foe. Cast Down , lets us remove some stuff that could cause issue. Chart a Course for draw. Any help/ ideas are very appreciated! thank you!!! Rats got trashed I mulliganed 4 hands, once down to 5. After talking to opponents we decided that there may need to be another color splash to make thus deck work. Pros of each color splash Red- Judith, and removal, and that one Red cantrip that gives trample. Green- Ramp to get more rats out, poison tip archer, rabid bite White- protection with make a stand and unbreakable formation, the exile enchants and buffs through Charge of the like. not sure which route i want to go. I have some of the shock lands for the red splash so that might it but let me know your thoughts. This deck is Standard legal. All the cool kids have Control Decks!